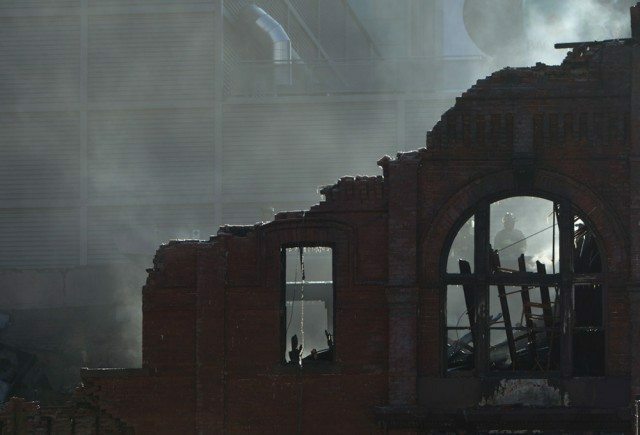 The gutted remains of a heritage building after a six-alarm fire at the site, formerly the location of the Empress Hotel. Earlier today, Toronto Police Service announced the arrest of a suspect in two downtown arsons, including one that gutted a heritage building at 335 Yonge Street in January 2011. Police at 51 Division told media this afternoon that they arrested 53-year-old Stewart Poirier of Toronto after he failed to check in with his probation officer on Friday. A combination of witness statements and what they would only call “other evidence” led them to charge Poirier with both the Yonge Street blaze and another fire last week at 123 Sackville Street, a Toronto Community Housing building where Poirier lived. Poirier was on probation after being convicted of arson in April 2011, for setting a fire at the Inglewood Arms Hotel on Jarvis Street. In addition to two counts of arson and probation violations, Poirier was also charged with two counts of mischief endangering life and one count of attempted murder in relation to the Sackville Street fire. Police wouldn’t speculate as to motive, nor would they say whether or not Poirier had any connection to the Lalani Group, who wanted to redevelop the site at Yonge and Gould, once the site of the Empress Hotel. They did, however, say that both arsons showed evidence of careful planning, and that police and fire marshals were investigating Poirier’s involvement in other incidents around the city.